Even if you haven't got rice or quinoa ready to go in the freezer you could use 90 second microwave rice and still whip them up in no time at all. 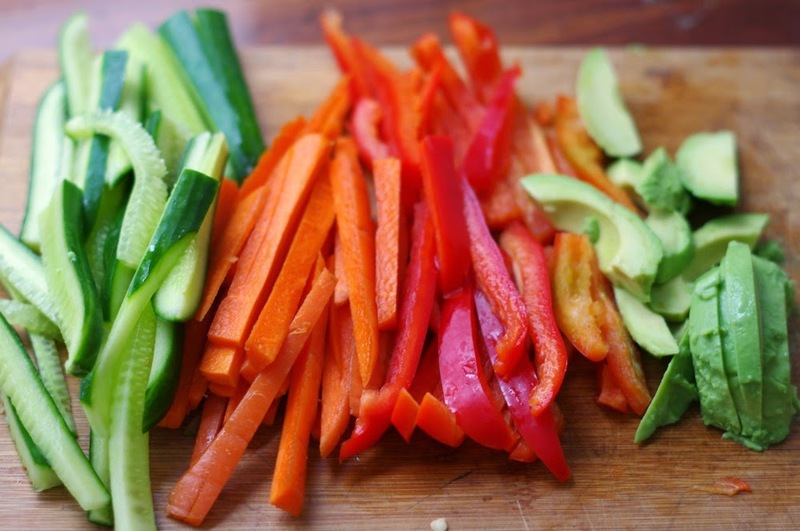 Simply julienne up your favourite vegetables. I use Lebanese cucumber, red capsicum, carrot and avocado. The avocado is essential as it adds a great creaminess. Rice wine vinegar adds a little extra zing to your quinoa or you can use mirin instead. You can also add a little sugar (2 tsp) to get a sweeter tasting sushi 'rice'. 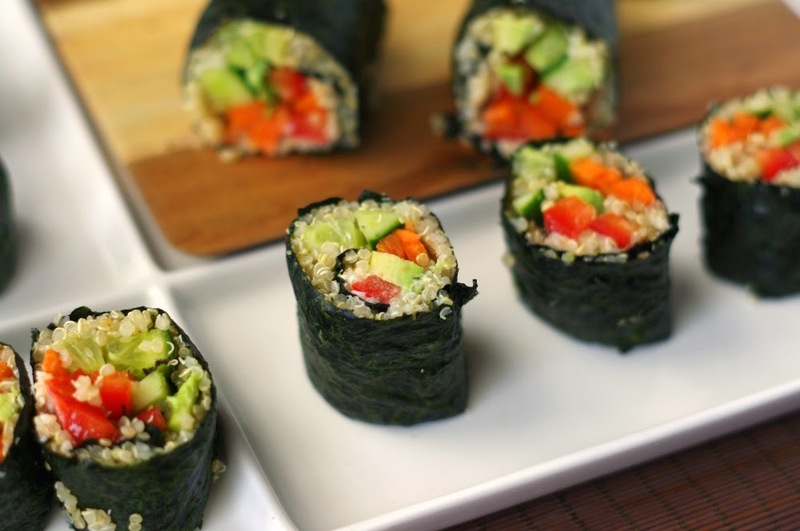 Spread your quinoa (or rice) over the entire nori sheet keeping 2cm at the far end of the nori sheet free of rice. Dab some mayonnaise along the length of the sheet and lay your other ingredients on top and roll up tight. Wet the end of the nori with a little water and press together. Nori sheets, made from edible seaweed, and rice wine vinegar are available in the Asian section of all supermarkets. You can eat them whole or cut them up into smaller serves. Dipping a sharp knife in hot water before cutting makes it easier to get a clean cut. You can use traditional dipping sauces such as soy sauce or sweet chilli sauce but I think these really come alive if you use hummus as a dipping sauce. It makes the flavours sing and adds another wonderful creamy element. These are also great made with tuna, salmon, egg or chicken to up the protein level. I also like to sometimes toast some sesame seeds and mix them in with the quinoa. 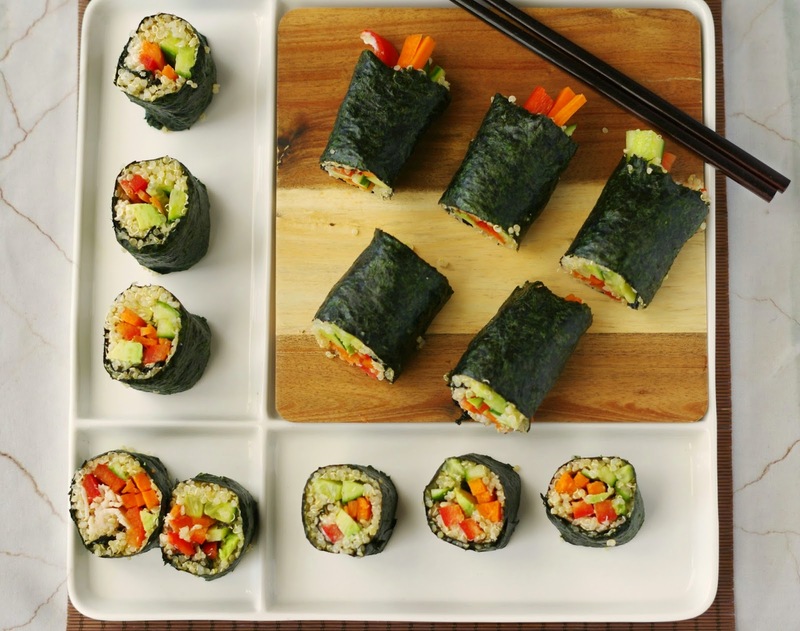 Quick, healthy, colourful and tasty - these nori rolls make for a great summer lunch. Place 1 cup of quinoa with 2 cups of cold water into a saucepan. Bring to the boil, then reduce to a simmer, cover and cook for a further 12-15 minutes. Turn heat off and let sit with lid on for further 5 minutes. 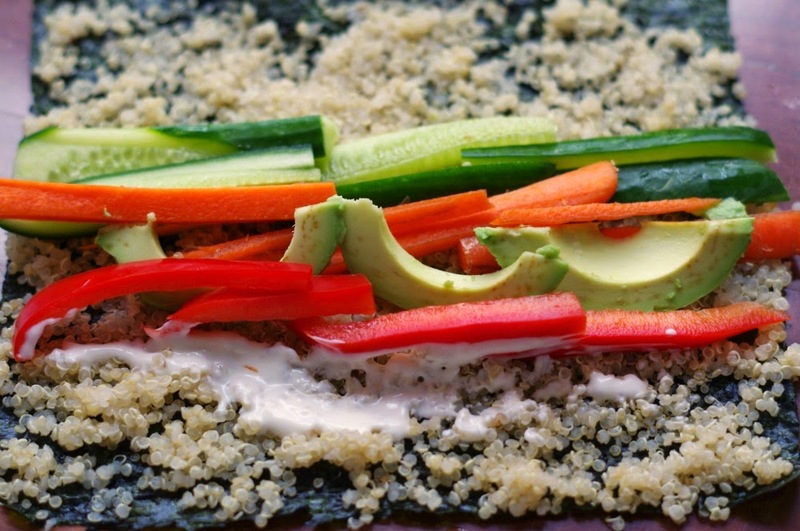 Spread quinoa on tray and sprinkle with rice wine vinegar and mix through gently. Allow to cool (place in fridge to speed cooling). Meanwhile cut vegetables into long thin slices. Gently spread cooled vinegared rice over nori sheet, keeping about 2cm at the far end of the sheet free from rice. Dab a small amount of mayonnaise along the rice in a straight line. Place the vegetable fillings on top of the mayonnaise. Lift the front of the sheet closest to you and begin to roll the sheet tightly. Just before reaching the end of the sheet wet the exposed edge with a little water. Apply gentle pressure to join the edges of the nori. Rolls can be eaten whole or sliced with a wet, sharp knife. 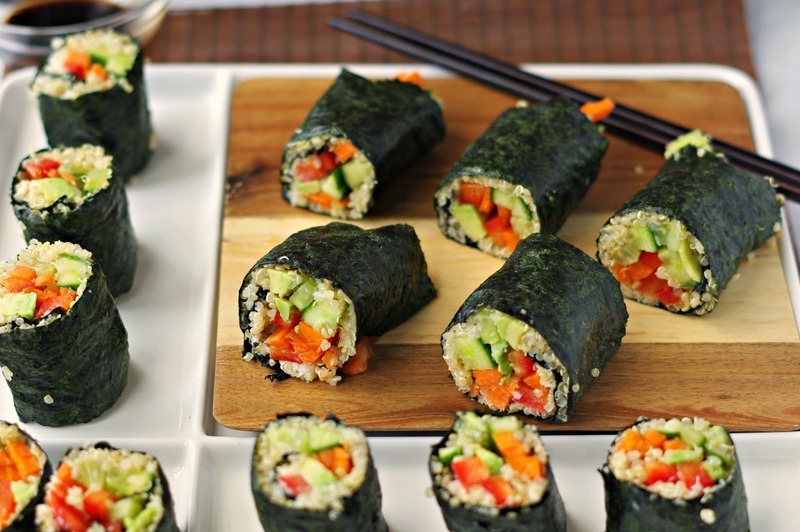 Have you made nori rolls before? What are you favourite fillings? My girls love these and it has been a while since I have made any. Thanks for the reminder. 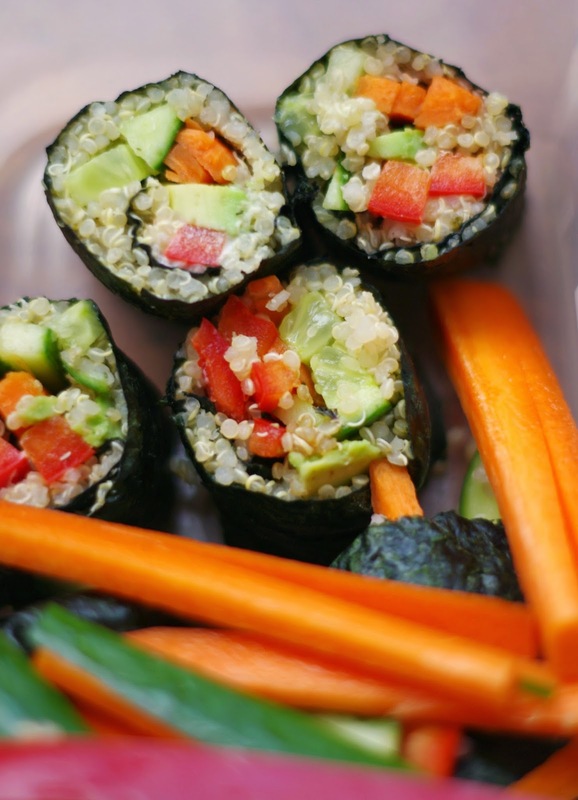 I love that you used quinoa in these nori rolls, I often make vegetarian sushi and usually just use red or black rice - so I definitely have to try this quinoa version! Love the look of this recipe! I've featured it on my blog as one I'd love to try out. Thank you so much, Danielle! I would be happy to send you a copy of our Summer recipe guide when it's completed. :) Please feel free to email me at aliciaw@saddleback.com if you would like one, or if you're comfortable you can leave your email address here and I will be sure to forward it to you. Thank you again!